What is an Oklahoma General Home Inspection? An Oklahoma certified licensed Home Inspector performs an unbiased comprehensive, detailed inspection of the home's interior and exterior systems and components, from the roof to the foundation. The purpose of a Home Inspection is to determine the overall general condition, details and possible areas of concern that may need to be addressed prior to purchasing. How is this Oklahoma General Home inspection performed? Home Inspections take about 1.5 to 3 hours depending on size, to perform. The licensed home inspector will professionally inspect the home's overall condition so the home buyer can make an informed decision of the home they are purchasing. 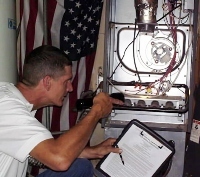 Please note this is not just an EMP (Electrical, Mechanical, Plumbing) Inspection, but much more comprehensive, including the roof, attic, drainage, windows, doors and more. This home inspection additionally includes at the end of the inspection, a verbal walk around "summary of findings" with explanations and recommendations, direct with the client while at the home. A detailed written online report with descriptions and pictures and a summary report, is emailed to the client within 24 hours after the inspection. This written report is to help further the understanding of the property's characteristics and overall condition for future reference. Delivered within 24 hours or less. $325.00 up to 3000 sq. ft.
"Thanks David!!! You did an awesome job and we will happily recommend you to other customers." Evelyn M.
"Dave thanks for inspection and the quick turnaround on the report. It is very well done and easy to follow. I will definitely recommend your service to others if given the opportunity." Wes L.
"Hello David, Thanks again for all your assistance and educating us on just about everything needed for our home!!" 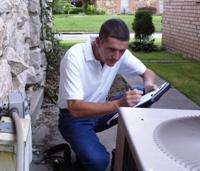 Bobby G.
Inspecting homes in the Owasso, Skiatook, Collinsville, Oologah, Claremore and Tulsa Oklahoma Areas since 2005. Home Inspector, Dave Charles Smith, Lic # 70000665, DCS Home Inspections, (918) 636-2746 performs Professional Oklahoma General Home Inspections for resale and new construction homes. Dave is considered a " Master" in his field of work. He is a Competent, Experienced, Honest and Knowledgeable Home Inspector with over 12 years full time experience inspecting buyers and sellers homes in the local Tulsa County, Rogers County and Osage County areas of Green Country, Oklahoma. Dave has inspected over 2000 homes in the Tulsa Oklahoma areas for home buyers and sellers.